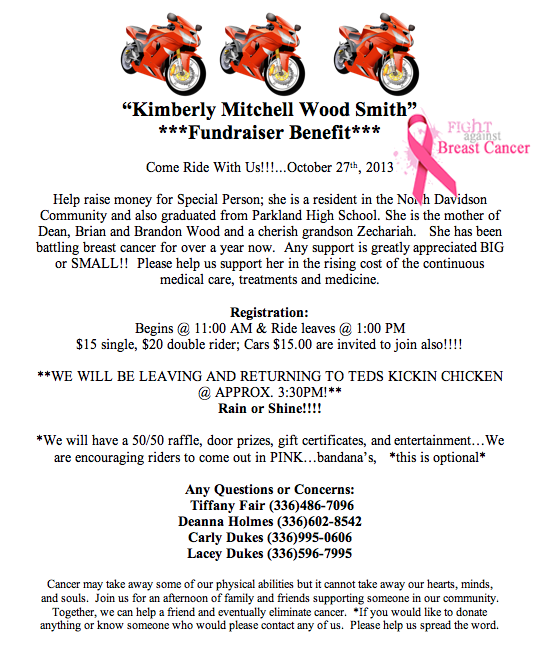 Kimberly Mitchell Wood Smith… RIDE FOR A CURE BENEFIT… (Motorcycles and cars) | Whats Happening? Fundraiser Benefiting Kimberly Mitchell Wood Smith, a Parkland graduate from the North Davidson community. She has been diagnosed with breast cancer. Kim, her sons (Dean, Brian & Brandon) and her cherished grandson Zechariah, as well as many other devoted family and friends greatly appreciate everything we can do for them; big or small! The ride will be followed by fellowship, 50/50 raffle and many other raffle prizes including Steamsters full house carpet cleaning, customized cake gift certificates & a photo session. Registration begins at 11:00 am at Ted’s Kickin’ Chicken. Kick stands up at 1:00. *Donations can be made in the form of monetary, gift cards or anything you see fit to help! Message any questions to Tiffany Fair, Deana L Holmes, Carly Dukes, Lacey Dukes or Tori Dukes. Please come to show your support for Kim as she fights her battle with breast cancer.This will be a day filled with bikes, cars, friends, music and fun. Please share & repost this with your friends, we really want Kim to feel love & support from the community with a large turnout. Please help spread the word! Click here to download FREE FLYER>>>Thank you in advance!